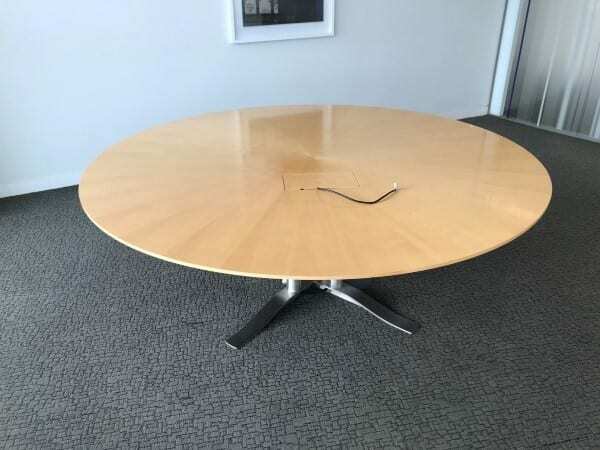 Sitting on a four star chrome base, this round maple meeting table features a solid maple veneer top with central cable access to allow wires to be fed through to connect to power. If you are interested in buying this meeting table or would like further information, please contact one of our sales team on 07944 508282, or click on the Telephone Icon located at the bottom of this page. Otherwise, we have an extensive range of other second hand office meeting tables in stock. Just click on the link provided, or simply enter your details into our ‘Request a Quote Online’ form below and one of our sales team will be in touch very soon. As always, this table can be viewed in our showroom along with all our other used office furniture.